At this point in your career or job search, you’ve probably heard a lot about skills. 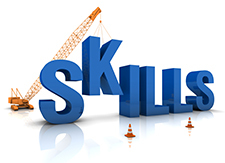 There are hard skills, like typing and reading, and soft skills, like etiquette and time management. You know that you should seek ways to sharpen your leadership abilities and brush up on your communication talents. But, today’s business world is constantly changing, which means the skills employers seek are, too. In fact, there are a few surprising skills you may not even know you need to improve your chances of landing a job this year. According to FastCompany, there are eight career skills that will not only help you secure interviews, but also seal the deal with a potential employer. Among those skills are some familiar qualities, like strong communication skills and the desire to learn. Employers are always looking for people who know how to communicate effectively, no matter their role in the company, and you should never turn down the opportunity to learn a new skill, equipment, or ability. There are other skills FastCompany mentioned, however, that are not so common. Let’s take a look at the abilities you may not know you need. According to Paula Caligiuri, professor of international business and strategy at Northeastern University, leaders rank working with people from different cultures as their weakest skill. This weakness could be because they lack the opportunity to work with other cultures, or because they aren’t aware of its importance. Paula says that when you study and interact with other cultures, you learn tolerance, perspective, and humility. These are all traits that employers like to see, so take some time to learn about other cultures and sharpen your knowledge of how business works in countries other than your own. Did you know that the fastest-growing economies are in Asia and South America? Businesses today benefit from knowing how prosperous countries are doing business, growing, and succeeding. If you know how to market, sell, and communicate to those countries, you automatically make yourself an ideal candidate for employers who need those skills on their team. Conflict exists in virtually every workplace. But, how you deal with that conflict says a lot about you. Companies want to find employees who work well with others and know how to effectively resolve conflict. Take some time to learn skills that help you address issues as they arise and sort through conflict, like communication skills and anger management. Many employers will rule out a candidate if they don’t know how to resolve conflict, so make sure you aren’t one of them. According to Merriam Webster, the study of analytics is “a careful study of something to learn about its parts, what they do, and how they are related to each other.” It’s also classified as “an explanation of the nature and meaning of something.” In your career field, analytics may mean the study of how many visitors the company website attracts, how many customers are buying products, or which days of the week are better for your business. Whatever it may be, understanding how to read and decipher such information is essential to successfully stand out from the job search competition. Be sure to brush up on your ability to research and sort data, and include examples of how you’ve used analytics on your resume. What other skills do you think are important for landing a job this year? Share with us in the comments section below. Previous Post Poll: What Is the Key Factor That Contributes to Your Job Satisfaction? Next Post The Results Are In: Do You Have a Mentor?